Etiquette is a very important part of Japanese society, and we incorporate some aspects into our training, particularly those pertaining to Samurai and martial arts culture. Proper dojo etiquette is important to maintaining our dojo and good spirit. When you arrive for class, please remove your shoes by the door. There are currently no dressing rooms in the dojo; however, the building restrooms are spacious enough to use for changing into training clothes, if needed. There are areas inside the dojo to leave your belongings during class, but it is not secure storage: Please do not bring any unnecessary valuables with you. Once the mat is open, please feel free to stretch and warm up before class. Bowing is an important part of Japanese etiquette. In Aikido, we bow quite frequently. 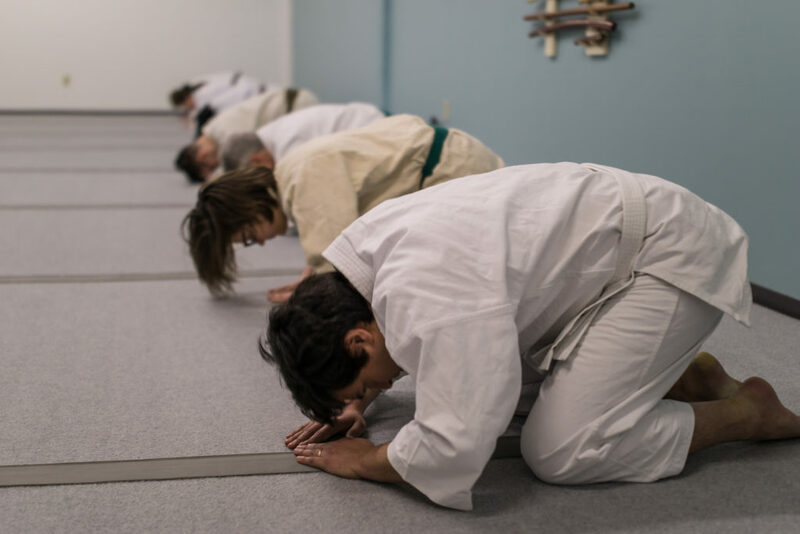 When we enter or exit the dojo, we bow towards the center front of the room. Likewise, when we step onto or off of the mat, we bow to the same place. This is done to show respect for the dojo and our training. At the beginning of classes, the students and teachers bow to the front of the room. Following this, the instructor faces the class, and students and instructor bow to each other to thank each other for training. The same bows are repeated at the end of class. Before and after training, partners bow to each other to thank each other for training. 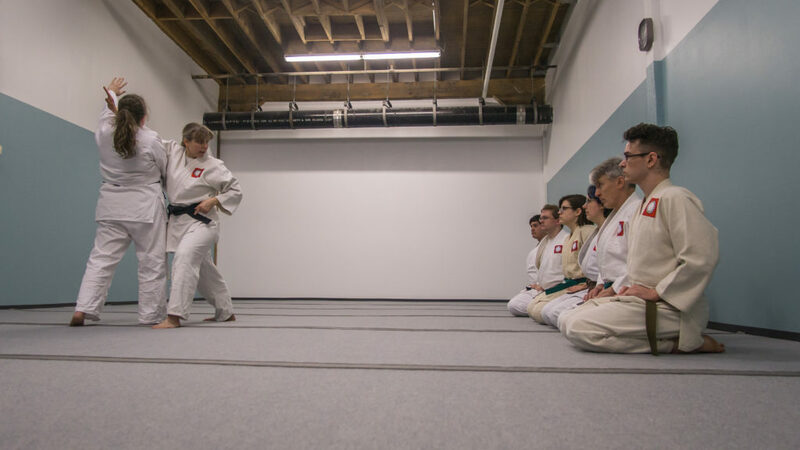 By bowing at these points we create a clean beginning and ending and encourage a nice relationship between students, instructors, and the dojo. Beyond this, students will often bow to each other to say hello, good-bye, thank you, you’re welcome, or other greetings. Please keep talking to a minimum during classes. Talking can result in you or the people near you missing some instruction or correction. 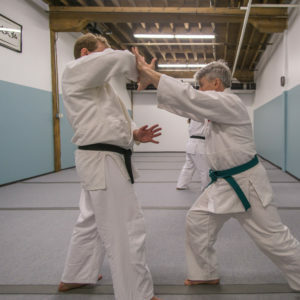 The best way to learn Aikido is by watching and doing. If you are confused, follow an experienced student and they will help you. If it is an issue of safety (such as if you have an injury that your partner should be aware of) please speak up and make sure your partner knows. Most questions, can be answered just by trying the technique or watching others. If you still have questions after class, feel free to ask an experienced student then. Hygiene is another very important part of Aikido. In addition to being a sign of respect, proper hygiene has very practical applications. In many of our techniques we end up in close proximity to each other. If one’s body or breath smells bad it can make these experiences unpleasant. Please come to the dojo with a clean body and clean breath. Please also keep fingernails and toenails trimmed for the safety of your training partners. The same ideas hold for the clothes in which you train: They should be clean, free from unpleasant odors, and in good repair. Please also be sure your feet are clean, so that they do not stain the mat (especially in summer if you wear sandals! ).